Wrap-a-wrap-a-wrap, they call me the wrapper. Wrap-a-wrap-a-wrap, there's nobody faster. Had I known at the time that I would have entire days when I could not get this jingle out of my head, or that I would have weeks where I would average approx. 25.4 bars of soap per hour in a 24 hour period, I may have thought differently of it. I'm really not a product person, but the green tube you see is Weleda skin food, the best hand cream in the universe. I guess being a 'wrappa' was your destiny! have been on the look out for hand cream recomendations for an age, thanks, this looks like it's worth a go! look at those hands go! I also am always on the lookout for hand cream recommendations too, it's been a joint obsession with joey and i lately. what does weleda smell like? that's one of my selection criteria. the weleda cream smells like lemon verbena, and not in a synthetic, sweet way. but a honest to goodness verbena, it you get my drift. gale you know the wrap-a song!? This really is great hand cream. My good friend is from Germany and told me about their products- all natural. Good stuff! 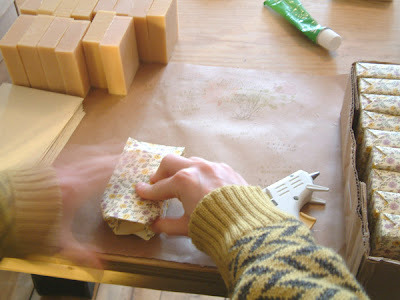 Such pretty paper that you're using on the soaps. Thanks for the recommendation on the hand cream. I know your soaps are the bomb. We just started offering them in our shop and they've been really well received. And I love the packaging.. keep wrapping. I only imagined what the wrap-a song sounded like and used your words to the tune I made up. I know you like that weleda but I would like to recommend another hand lotion. Caren, it is actually doctor recommended for patients undergoing radiation for cancer, eczema, psoriasis, and dry cracked skin. It is an aloe based lotion rather than water based. Most lotions you look at the ingredients and the first ingredient is water so when you wash your hands you wash off the lotion. Caren has the first ingredient of aloe so it actually absorbs into the skin and heals it. If you are interested let me know. 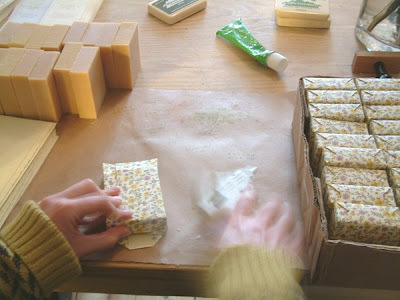 wow...how do you get your soaps so neatly wrapped? They look sooo professional. I think every person ought to read it.